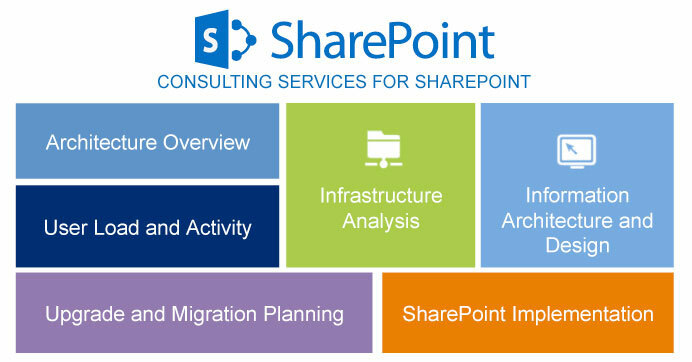 Our menu of services for Microsoft SharePoint includes business consulting and full enablement of enterprise collaboration and content. SharePoint On-Demand: A one-stop solution for all cloud enablement needs of an organization. The solution eliminates hardware and associated operating costs, includes fast set-up and the ability to scale up or down as capacity requirements change. Intranet: SharePoint is the industry leader in managing intranet Web publishing processes. It brings employees together and facilitates enterprise operations through shared information systems. Internet: SharePoint’s continually expanding capabilities make it a leading content management systems for large‑scale public Web sites, enabling companies to gain greater control of sprawling Web properties. Extranets: SharePoint provides the security and functionality to open up an organization’s knowledge and processes to partners and customers, creating greater efficiencies and new options for virtual business operations. Enterprise Portals: SharePoint is becoming an increasingly popular means of bringing order to disparate systems through single sign‑in and a unified view of the enterprise.